The Hickey Building: reminds us of our humble beginnings, with the original school building still standing proudly within the College today. The Mortar Board: encapsulates Br Hanrahan’s love of learning and the fact that he was a keen academic. It also reminds us that with knowledge we have the power to be the best we can be. 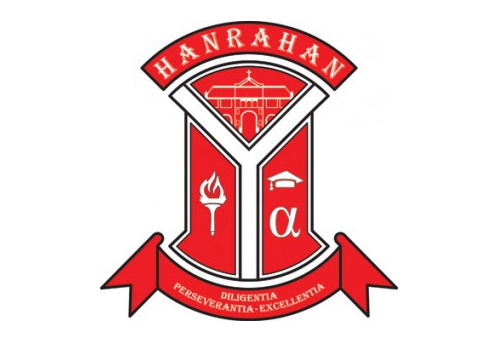 The Alpha Symbol: this, the first letter in the Greek alphabet, recognises Br Hanrahan’s love of Greek philosophy and his place at the beginning of our College’s history. The Flame: since Br Hanrahan was a keen advocate of sport, the significance of the flame is twofold. Firstly it embodies what we should strive to achieve in all our endeavours, sporting or otherwise: excellence, respect and friendship – the Olympic ideals. It also represents the light of Christ, as we reflect on the work of the Christian Brothers, both past and present, who continue in the mission of our Founder, Blessed Edmund Rice. The Gladiators Helmet: When the symbols are removed from the Hanrahan crest, an image of a gladiator’s helmet remains illustrating that we as a house stand united, and are a formidable force. Hanrahan House recognises the efforts of an outstanding educationist by the name of Br Michael Benignus Hanrahan. As the first Principal of St Patrick’s College he led the school from 1928 to 1929. Michael Benignus Hanrahan was born in New Zealand and attended the local Catholic Primary school where he was a ‘star pupil’. Upon completion of his education, Michael Hanrahan joined the Christian Brothers at the age of 16 and came to Sydney to begin his training as a teacher. Following a brilliant University career and having taught in numerous schools in NSW, Queensland and WA, Br Hanrahan was transferred back to Sydney where he was appointed the first ‘Master of Method’ at the Mount St Mary Training College in Strathfield. His obvious flair as an educationalist had him involved in teacher training for the next 40 years. 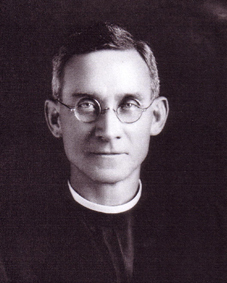 In 1920, Br Hanrahan became a member of the governing council of the Christian Brothers of Australia, and from 1930-1942 the Provincial Leader. In this role he saw the establishment of 17 new Christian Brothers schools around Australia and New Zealand, one of which was St Patrick’s College, Strathfield. Br Hanrahan was by all accounts a philosopher. In particular he was a big fan of Aristotle and would often apply his deep knowledge and interest in all matters of the mind to his classroom technique. He was an enterprising seeker of knowledge who, by his own description, was determined to be ‘a picker up of learning’s crumbs’. Not only a fine scholar, his tall athletic figure would often be seen on the cricket field or on the courts partaking in a vigorous game of handball! After he officially retired in 1943, Br Hanrahan regularly came down to St Patrick’s to teach a Religious Education Class.